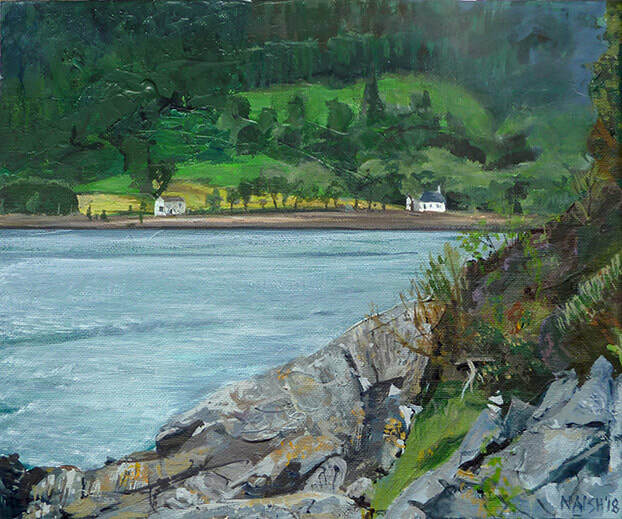 This piece was painted en plein air while holidaying in Scotland. Following a week travelling up the left-hand side of the country, we settled for our second week in a holiday let on the banks of Loch Duich, not far from the Kyle of Lochalsh. The setting was picturesque in the extreme, and so I took to some painting in the wild. This was the first piece, and spoilt for choice, I rather timidly plumped for a simple part of the scenery. I did no preparatory compositional sketching on this occasion and plumped for drawing straight to canvas. After weeks of unbroken sunshine, we actually experienced clouds and some rain as the rest of the country basked in record heat. Lighting naturally altered throughout the day as did the water’s appearance. I decided to capture the roughed-up look of the tidal Loch, though at other times it was perfectly reflective with a combination of the two at other times. The hills on the far shore predominantly had a blue distance haze but I depicted them during a particularly sunny period. This lead me to cheat the background haze at the right-hand side to ensure that the foreground foliage stood out. Completed completely at the location, I hope this represents an accurate snap shot of the view.